D R Burton Healthcare Products LLC, makers of surgical and respiratory products, is attending The Association of periOperative Registered Nurses (AORN) Surgical Conference & Expo 2016 in Anaheim, CA on April 3-6, 2016 in booth 2126. D R Burton is a medical device innovator driven by unique clinical perspective. D R Burton Healthcare Products LLC, makers of surgical and respiratory products, is attending The Association of periOperative Registered Nurses (AORN) Surgical Conference & Expo 2016 in Anaheim, CA on April 3-6, 2016 in booth 2126. D R Burton is a medical device innovator driven by unique clinical perspective. This perspective, combined with superior product research and development along with quality manufacturing, provides customers with a world class user experience. D R Burton was founded by Dr. Joyce Burton, physician, respiratory therapist and engineer. Her unique background and experience places a high value on patient usability and improved clinical outcomes. 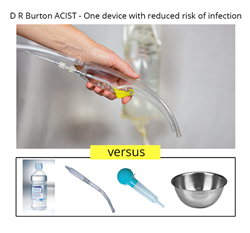 This is demonstrated in the D R Burton ACIST™, Augmented Closed Irrigation Suction Technology, which combines both surgical suction and irrigation into a simple one-handed device with reduced risk of infection. Dr. Joyce Burton explains, "Surgical wound irrigation has long been debated as a potentially critical intraoperative measure taken to prevent the development of surgical site infection (SSI). However, the use of IV solution in an open basin is far from sterile technique.” The D R Burton ACIST replaces the OR use of open stainless steel irrigation basins with a closed sterile irrigation device. The D R Burton surgical and respiratory products will be displayed for clinical feedback at the AORN Conference. Visit D R Burton to discuss these products and other innovative concepts at booth #2126, on April 3-6, 2016.